It can be easy to get overwhelmed when you’re car shopping. There are SO many choices, and it seems like there are endless options even within particular segments of cars. However, it’s important to make the right decision as a car is a long-term investment! Your best bet to finding the perfect new car is to do your research beforehand, and our N Charlotte Toyota dealership wants to help you do that. 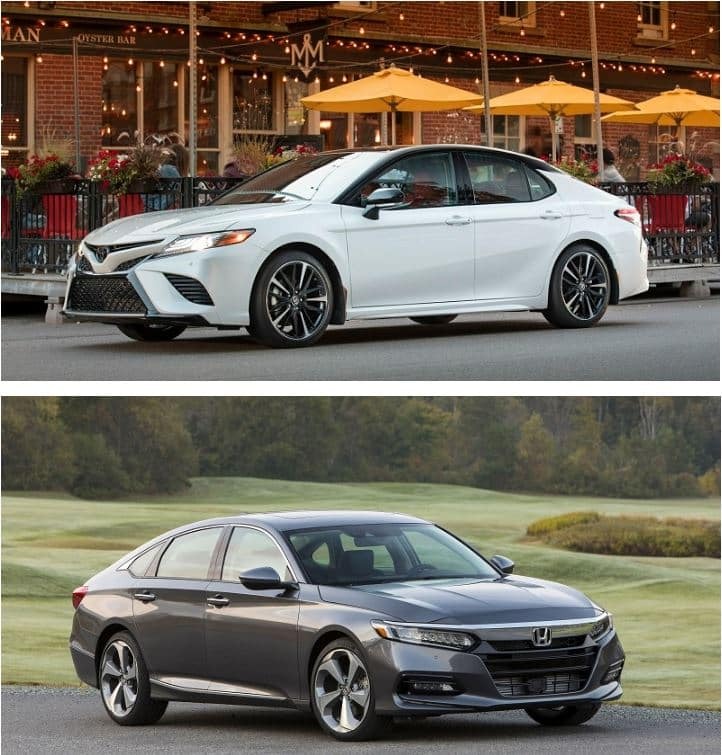 Today we’re comparing two of the most popular midsize sedans on the market – the 2019 Toyota Camry or the 2019 Honda Accord. Which would you drive -the new Toyota Camry or new Honda Accord? Which would you put in your driveway? Both offer great drive time solutions, but according to a recent comparison by Us News and World Report, one of them has a slight edge – the 2019 Toyota Camry. Check out how things break down below. Let’s start with price. Believe it or not, it’s close, but this N Charlotte Toyota pulls ahead. It’s starting MSRP is $23,395 and the top model lands at $34,700. The Honda competition has a starting MSRP of $23,720 and the top model is priced at $35,950. The Toyota is slightly more affordable the higher you go in models, and Us Report and World News also named it the Best Midsize Car for the Monday for 2019. How about reliability? We know that’s an important factor. JD Power scores aren’t out for 2019 yet but in 2018 the Toyota Camry scored a 4.5/5 while the Honda Accord only got to a 4/5. Plus, Toyotas are renowned globally for their reliability and longevity. Let’s talk performance next. While both of these sedans come in both 4-cylinder and V6 engine options, you’ll find that the N Charlotte Toyota pulls ahead with more horsepower in both categories, despite the fact that the Honda offers a turbocharged 4-cylinder engine. Our Toyota also gets better fuel efficiency (29/41/34 mpg for the gasoline engine and 51/53 mpg for the hybrid while the Honda caps out at 30/28/33 mpg for the gasoline engine and 47/47 mpg for the hybrid). Technology is always high on the list of must-haves. These cars are quite similar in what they have to offer – 7″ touchscreens with Bluetooth – but our new Toyota offers Apple CarPlay standard, something that its Honda competition lacks. It also offers 6 speakers while the Honda falls short with just 4. Safety tech is also another important must-have feature. The N Charlotte Toyota Camry offers several additional features not found in the Honda Accord, like automatic high beams and pedestrian detection. It also has a higher IIHS Top Safety rating, having earned a Top Safety Pick + designation (the Honda competition only got a Top Safety Pick rating – no +). Last, let’s talk the interior. Both are comfortable and stylish but Toyota goes the extra mile to make the interior as plush as possible while Honda uses several cheaper-looking plastic pieces that aren’t cohesive with the rest of the cabin. Overall, the aesthetic is better in the Toyota Camry. Test drive today at Toyota of N Charlotte! Ready to test drive? Come on down to Toyota of N Charlotte to see the 2019 Toyota Camry in person! We’re open seven days a week at 13429 Statesville Road, just off I-77 at exit 23.